What makes our outdoor buildings better? Sheds are locally built & assembled right here in Fruita, Colorado and are delivered to you completely assembled. We use 3/8" LP Smart Side Panel Siding on all of our portable buildings. This siding is primed & will need to be painted. T-111 is an option for a up charge. Are doors are built with commercial heavy duty hinges so your door won't sag and the locking handle comes with two keys. Our storage sheds can be custom built with a variety of options to meet all your storage needs. 12' Wide or smaller sheds have FREE DELIVERY to Mack, Loma, Fruita, Grand Junction, Clifton, Orchard Mesa and to the Redlands. *Pilot car may be required for a up charge on 12’ wide buildings. If you have a used wood frame constructed shed and would like to upgrade to a new shed, come talk to us about trading in your old shed! Looking for quality lawn furniture? Check out our Amish Made Maintenance Free Lawn Furniture! 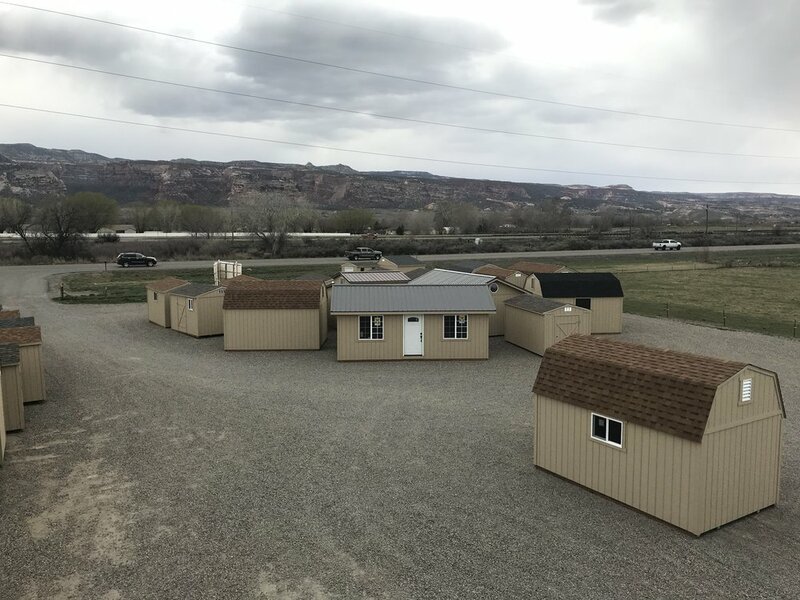 All of our portable buildings are built locally here in Fruita, Colorado!